The work of any church is done by an army of dedicated people. Some are staff, some are volunteers—some are a lonely team of one. It’s often thankless work, so do everything you can to say thank you. 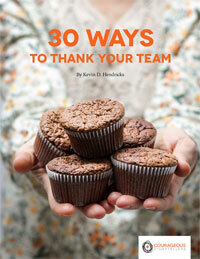 We’ve got a list of 30 ways to show your appreciation and thanks. Handwritten note: Seriously, hand write it. Like, with a pen and paper. And say something thoughtful. (If your penmanship is atrocious, get a typewriter.) Send it through the actual mail for bonus points. Gift cards: Pick somewhere the person actually likes. A gift card for a store you never go to is lame. If you’re not sure, pick a local restaurant or coffee shop. If you’re really stuck, go with an Amazon gift card or straight up money gift card. Home-baked goods: You can’t go wrong with homemade food. Cookies, cake, snack mix, etc. Bring treats: And if you can go wrong by trying to bake, then pick up some tasty treats. Spring for the good stuff. Find the best donut/bagel/cookie shop in town, don’t just go to the bakery section of the grocery store and get the stale leftovers. Cover dinner: Or go over the top and make them an entire meal. Serving your team a meal is a great way to provide for them and also spend time together. Get more practical resources by joining Courageous Storytellers. Every month we offer new resources focused on a specific theme, for an ever-expanding library to help you communicate better. Join today.